Three men accused of involvement in a double murder and of carrying out a drive-by shooting have been acquitted. 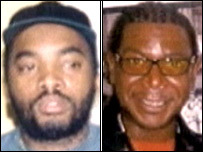 Rufus Edwards and Mark Warmington were murdered at a Jamaican social club in Croydon, south London, in 2004. Less than an hour later Asha Jama and Donna Small were seriously injured when the car they were in was hit by a hail of bullets in Bristol. Nine men were charged, but six were cleared on Tuesday. The remaining three were acquitted on Wednesday. Marcus Anderson, 28, of Thornton Heath, south London, Darren Little, 30, from Mottingham, south-east London, and Craig Hughes, 30, of Peckham, south London, had faced charges of conspiracy to murder. Avon and Somerset Police said they were "bitterly disappointed" with the verdicts. On Tuesday Michael Lindo, 25, of Clapham, south London, was acquitted of murdering Mr Warmington, a nightclub bouncer, plotting to kill Mr Edwards, and conspiring to commit murders in Bristol and Croydon. Cleveland Fenderson, 27, of Bristol, Winston Minott, 25, of Bristol and Darren Valentine, 20, of Camberwell, London, were acquitted of involvement in conspiring to commit murder in Bristol. Former school friends Donna Small, 25, and Asha Jama, 22, had met by chance in a nightclub hours before the drive-by shooting in Bristol. 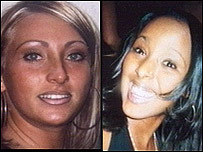 The Bristol incident came just hours after Rufus Edwards, 34, and his friend Michael Edwards were gunned down in front of hundreds of clubbers on the dance floor of the Spotlight nightclub in south London. Supt Geoff Spicer of Avon and Somerset Police refused to say how much the three-month trial had cost. "The true personal costs are that the lives of three people have been irrevocably changed and two men have been killed," he said. "The cost of doing nothing is unimaginable. "I'm bitterly disappointed with the verdicts that have been returned today. I'm disappointed for the families of Asha Jama, Donna Small and Michael Edwards and for the families of the two men who were brutally killed in the nightclub in London." He added: "The people of Avon and Somerset can rest assured that the police in this force area work tirelessly to bring the perpetrators of gun crime to justice."